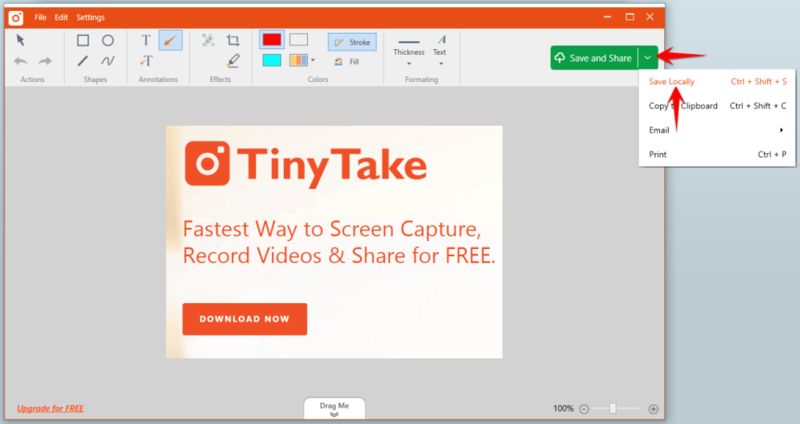 /Screen Capture & Record Video /What is Tinytake and How Do I Use It? How do I install TinyTake? How do I connect my MangoApps with TinyTake? How do I capture an image? How do I save a capture locally? How do I change the default key combinations for screen captures? After I’ve captured an image, what shapes and text can I add? How do I capture a video in TinyTake? How do I post my TinyTake screen capture to MangoApps? How to upload any type of files or folders? Can I review, edit, and reupload (or save) images from capture history? When I install TinyTake as the Computer’s Administrator, can other user accounts use it? What is the “Drag Me” feature in TinyTake? How do I pixelate a captured screenshot? TinyTake is a Windows screen capture utility that publishes images directly to your MangoApps domain. To install the latest version of TinyTake, download it from http://tinytake.com/#!/download or use your MangoApps web client and choose “TinyTake” from the “Client Apps” in the left navigation. Follow the on-screen instructions to install TinyTake to your Windows-based computer. After launching TinyTake for the first time, it will ask you to log in. 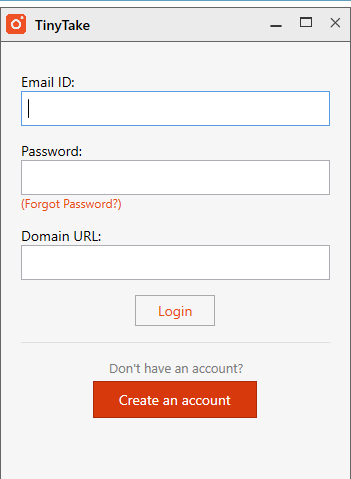 Enter your MangoApps credentials as prompted including User ID, Password, and Server URL as in this screenshot the click “Login”. How do I save captures locally? To save a capture locally, click on the icon annotated in the pictures below, depending on if you captured a video or an image. <CTRL> + <PrtScrn> Captures the full screen. <SHIFT> + <PrtScrn> Captures a region you specify. <ALT> + <PrtScrn> Captures the current window. 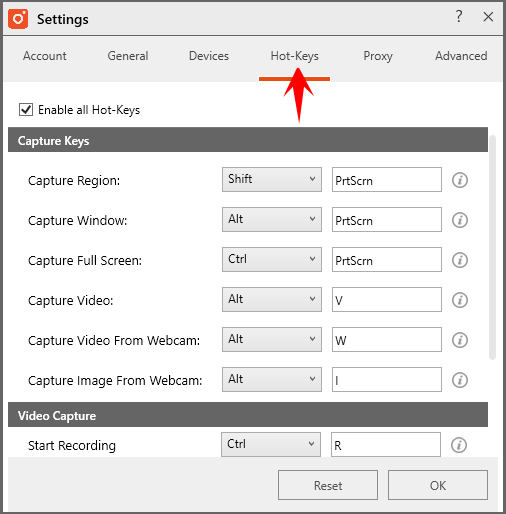 Pressing the key combination will freeze your screen and show a capture tool if the “Region” or “Current Window” key combination was pressed. Click and drag to select a region or click on the window that you want to capture. You can also use TinyTake gallery to select the capture option. From the “Hot-Keys” tab, click in the box of the hot key combination you want to change. Touch any key in given the following limitations to change the Hot Key combination. Click the “OK” button to register your changes and close the window. Pointer: Use the cursor selection tool to select and move a shape or text that has already been added to your captured image. Undo: Use the undo shortcut to undo your last edit to the image. There are multiple levels of undo. Redo: Use the redo shortcut to reverse your last undo action. There are multiple levels of redo. Draw Rectangle: Click and drag with the Draw Rectangle tool selected to add a rectangle to your captured image. Draw Circle: Click and drag with the Draw Circle tool selected to add an ellipse to your captured image. Draw Line: Click and drag with the Draw Line tool selected to add a line to your captured image. Draw Pencil: Click and hold with the Draw Pencil tool selected to use freehand drawing on your image. Draw Text: Click and drag to add a text box to your captured image then type in it to add the text. Draw Arrow: Click and drag in the direction that you want the arrow to point to add it to your captured image. Draw Arrow followed by Text : Click and drag to add an arrow followed by a text box. Pixelate: Make an area of the picture unrecognizable or unreadable. Crop: Select the region of the image that you want to keep. Highlighter: Click and highlight a specific area of the image captured. Arrow and Text Color: Change the color of the arrows along with the text. Fill Color: Fills the shape you have selected with a color that you choose. Border Thickness: With your shape selected, choose the line thickness of the outline of your shape. To capture a video, click the key combination (default is <CTRL> + <V>) or choose “Capture Video” from the TinyTake Capture menu. Then draw the region that will be shown in the video. When you are done recording, click the “Stop” button. Then choose the “Save & Share” icon or the “Save” icon. To close the video without sharing or saving, choose the X. Once a screen capture is done, you can upload the same to TinyTake server. 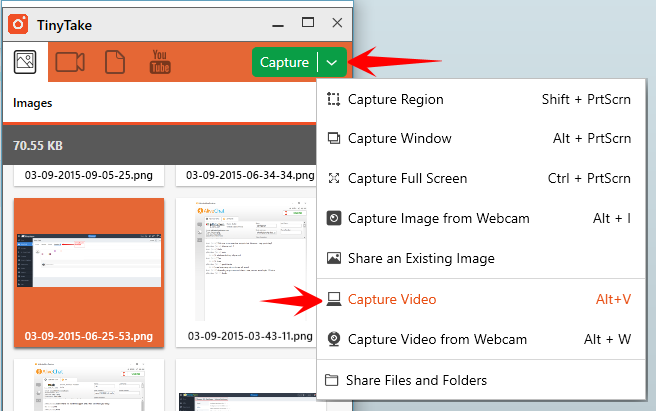 It will generate a link of an image which can be copied by right click on the capture > copy link to clipboard. Now share this link within MangoApps and user can view your capture online by clicking on the link. How to upload any type of file or folders to TinyTake? 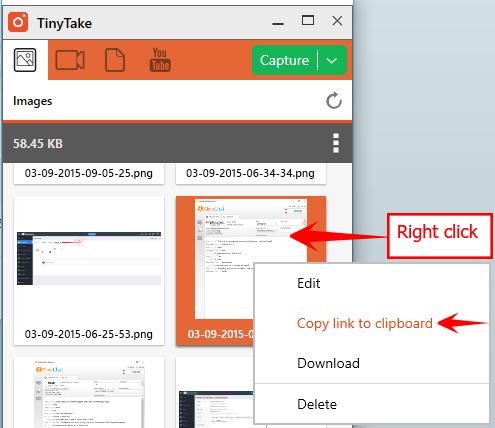 Right-click on one of the files or folders you highlighted and choose “Upload to TinyTake”. 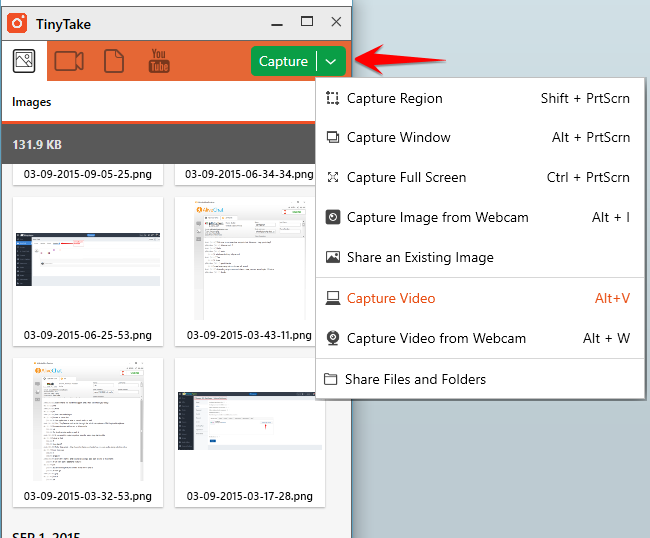 Alternately you can choose “Bulk Share” from the TinyTake system tray menu to Drag & Drop your files. Optionally rename the ZIP archive and click “Upload to MangoApps”. A link to the zip archive will be placed on your clipboard. Paste it anywhere to share the contents of the ZIP archive with anyone. 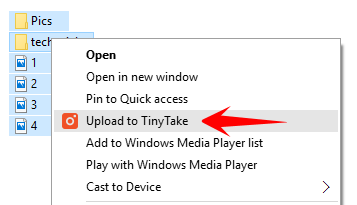 Right-click the “TinyTake” icon in the system tray and choose “Capture History”. In the capture history window, double-click the thumbnail of the image you want to continue to edit. When finished editing, use the familiar TinyTake tools to re-upload or re-save the image. Yes, when TinyTake is installed by the admin account on a computer, the other users on that account will also have the ability to use TinyTake for their screen captures. This includes user accounts and guest accounts. The Drag me feature in the image editor allows users to drag an annotated image directly from TinyTake to any application that supports images. This makes sharing an annotated image as an attachment much more accessible and faster than before. You can drag to the Windows File Explorer, your email compose screen or your favorite chat application. However, images shared in this manner are not uploaded to TinyTake and hence not available in the “My TinyTake Uploads” screen. If you have ever felt the need to hide a certain area of the screen capture (because it shows sensitive or offensive information) the Pixelate feature is made for you. Simply select that area in your screen capture image and Pixelate will make it impossible to read/see in that area. 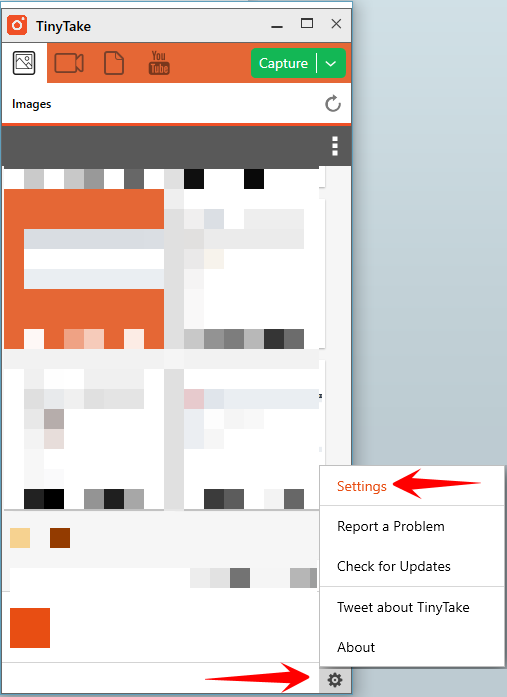 To report a problem, right-click on the TinyTake app icon from the system tray and choose “More” -> ”Report a problem” this will send an email to TinyTake support containing log file along with other required information. How Do I Record Sound Using Tinytake? How Do I Use My Microphone to Record Audio with Tinytake? Where Can I Download All of the Mangoapps Clients?